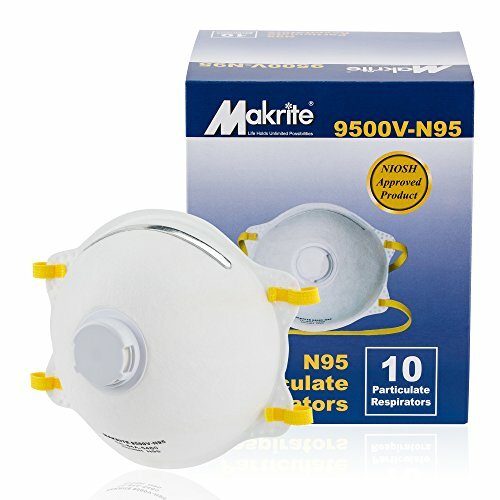 Makrite 9500V-N95 particulate respirator is NIOSH approved N95 disposal particulate respirator for reliable breathing protection of at least 95% filtration efficiency in workplaces surround by non-oil based airborne particles. The one-way exhalation valve is designed to help reducing heat and moisture build-up inside the mask and allow fresh cool-air at each breath. Makrite 9500V-N95 respirator with exhalation valve is best applied in situation where high temperature and humidity are involved, recommended applications include mining and quarrying, additional applications may be grinding, sanding, cutting, drilling, scrabbling, cleaning and other dusty but non-oil based operations. Makrite is one of the world's premier manufacturers of disposable face masks and respirators. Founded in 1984 in Taipei, Taiwan., we have always strived to provide the best possible face mask products to customers globally. Makrite products are now used in medical, industrial and retail markets all over the world. We welcome the opportunity to work with our customers to develop exclusive face mask products as well as special distribution partnership. Contact us for more information! **Please beware of ALL warnings, safety instructions and user instructions before using this mask. If you have any questions about this product by Makrite, contact us by completing and submitting the form below. If you are looking for a specif part number, please include it with your message.